Q. Do I have to create a free account with O’Reilly Safari for Higher Education? No. You don’t need to create an account with O’Reilly to access eBooks. With an account you can experience some personalized features e.g., customized homepage, recommendations based on topics of interest, and personalized notes and highlighted text etc.) If you have an account with O’Reilly Safari you need to click Already a user? 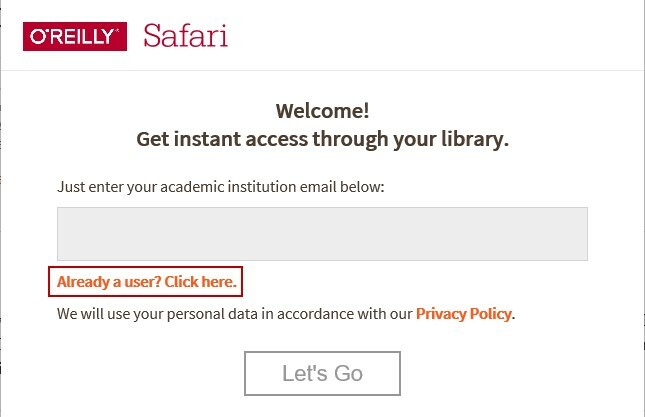 Click here to log into Safari with your SMU email address and your O’Reilly Safari password.